umice stone is a natural product of the earth, formed from lava. When hot lava flows and then cools quickly, the trapped gases create hard foam that turns into light and porous volcanic rock known as pumice. Known for its abrasive quality, pumice is an excellent and natural tool for scrubbing away dry, rough skin and callous areas of the feet, toes, elbows, hands and knees. 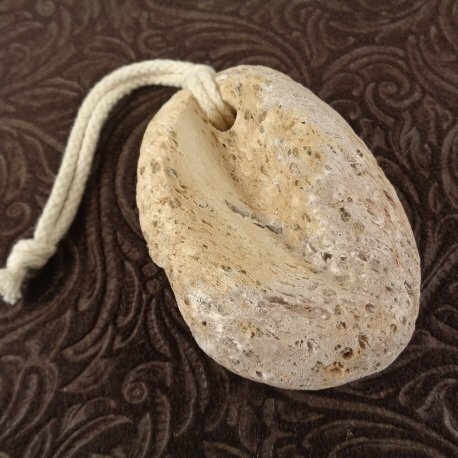 Our Pumice Stone has been lightly polished to remove rough edges and has been sculpted with a curved edge to comfortably fit around feet and elbows for maximum benefit. Equipped with a durable cotton cord, it hangs easily in the bath. If you have any questions about this product by J Lexi, contact us by completing and submitting the form below. If you are looking for a specif part number, please include it with your message.